A classic lunch with a holiday twist that your kids will love. In a medium bowl, mash eggs with a fork until they resemble coarse crumbs. Add mayonnaise, celery, onion, salt and pepper to taste and green food coloring. Mix thoroughly, set aside. Lay bread out flat. Using a clover cookie cutter, cut a clover from the center of each slice of bread. 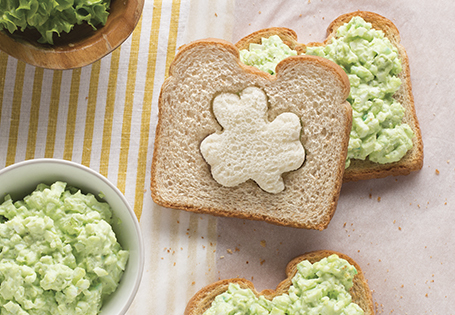 Place the wheat clovers in the white bread slices and vice versa. Spread the egg salad on the wheat bread bases. Top with white bread slices.